Breckenridge, Colorado rental Executive Chalet 160 cabin at Tiger Run Resort. Our Executive Chalets provide that extra quiet luxury you are looking for. 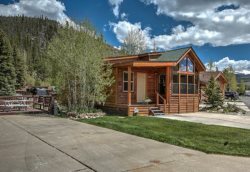 Chalet 160 is located along the back of the resort providing easy access to the Colorado Trail. This is our only Executive chalet that has both a Colorado Room and a children’s bedroom with a bunk bed which provides for extra living space during your stay. In addition to the master bedroom, children’s room, kitchen, bath, and living room this chalet has a divided loft which is set up as 2 different children’s play areas or may be used for storage. Some chalets do have gas BBQ grills and each chalet has a deck with outdoor seating. Generally, the chalets can sleep four (4) adults comfortably. Each chalet is stocked with kitchen utensils and linens. Check-in is at 4:00 p.m. Smoking and pets are prohibited in the chalets.